I was attending a class on Paneurhythmy, a sacred dance from Bulgaria which celebrates our connection with the earth. As we moved around the room in a circle, a hummingbird crashed into one of the windows. I left the dance and found him on the patio, two stories below. His neck was arched awkwardly and fluid pooled beneath his beak, but he was still breathing. I picked him up in my hand, hoping to assist in his final moments. How strange for him to lose his life, when we were dancing to celebrate life! Perhaps if I brought him into the dance room, he would receive a blessing from the sacred energy? I placed him in an empty shoebox, planning to set him in the middle of the circle. It suddenly occurred to me that if he revived and took off, he would be hard to catch, and might crash again into the windows. There was also a dog loose in the room. I decided the hummingbird would be safer in my hand, also benefiting from its warmth and energy. I scooped him up, enclosing him gently in my right fist, his head and beak poking out through the opening between my thumb and forefinger. 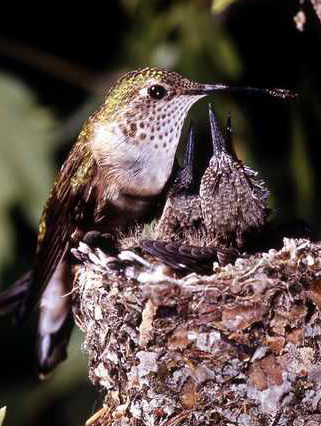 I then rejoined the dance, performing the arm and hand movements with my left arm, while the hummingbird rode along in my outstretched right fist. We danced this way for a while, the hummingbird peering straight ahead as we moved. A sudden fluttering of his wings sent me dashing outside. I opened my hand and he took off, falling straight to the ground. Once again I scooped him up, determined to be more careful. After seating myself on the ground, I opened my palm and he sat there, dazed but still. A gentle breeze played upon his feathers, and I marvelled at his shimmering green color and delicate features. Several times he stretched his neck and shook out his feathers, each time after which he sat a bit taller and looked a bit stronger. At one point he turned and peered at me intently, as if to say, "What are you doing here?" I felt blessed to be in the presence of such a gentle, wild creature. Then, without warning, he flew to a nearby bush. After resting briefly, he took off again, soaring effortlessly into the sky, to a group of distant trees. As I watched him go, I realized that we had both experienced a miracle that day. When Freedom came in, she could not stand. Both wings were broken, her left wing in 4 places. She was emaciated and covered in lice. We made the decision to give her a chance at life, so I took her to the vets office. From then on, I was always around her. This went on for 4-6 weeks, and by then she still couldn't stand. It got to the point where the decision was made to euthanize her if she couldn't stand in a week. You know you don't want to cross that line between torture and rehab, and it looked like death was winning. She was going to be put down that Friday, and I was supposed to come in on that Thursday afternoon. I didn't want to go to the center that Thursday, because I couldn't bear the thought of her being euthanized; but I went anyway, and when I walked in everyone was grinning from ear to ear. I went immediately back to her dowl cage; and there she was, standing on her own, a big beautiful eagle. She was ready to live. I was just about in tears by then. That was a very good day. We knew she could never fly, so the director asked me to glove train her. I got her used to the glove, and then to jesses, and we started doing education programs for schools in western Washington. We wound up in the newspapers, radio (believe it or not) and some TV. So the first thing I did was get up to Sarvey and take the big girl out for a walk. It was misty and cold. I went to her flight and jessed her up, and we went out front to the top of the hill. I hadn't said a word to Freedom, but somehow she knew. 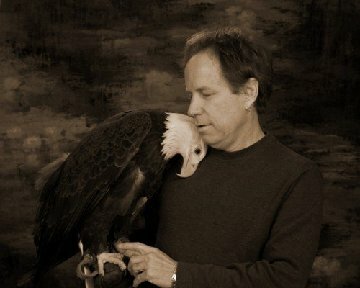 She looked at me and wrapped both her wings around me to where I could feel them pressing in on my back (I was engulfed in eagle wings), and she touched my nose with her beak and stared into my eyes, and we just stood there like that for I don't know how long. That was a magic moment. We have been soul mates ever since she came in. This is a very special bird. One day my great dane mix, Margarita, and I took a walk along the river near our house. We went to a nearby overlook and climbed down to the shoreline. As we walked under a concrete bridge, some Canada Geese (hanging out on the water) set up a ruckus -- intruders in their midst! We passed by them and kept going to a rocky "beach" past the bridge. I decided to sit for a few minutes and be still. The geese were very active, honking to each other and "side swimming" (floating down the river with their bodies at a 90 degree angle to the current) back by the bridge. I was enjoying the loveliness of their bird-like antics, and being in their company. I finally decided it was time to go, so we headed back along the shoreline, crossing under the bridge. As we emerged from the bridge, I realized the geese were following us! They were swimming at a safe distance (about 20-30 feet behind), but at the same speed as we were walking. We were "walking" together! At one point beyond the bridge, they stopped at a shoal, and I thought, "Oh, that's it -- I guess it's over." But as we continued walking, about 15 of them left the shoal and followed us. Farther down, we had to go inland to cross Gilbert Creek, which joins the river at that point; where it meets the river, it is too wide to cross. As we headed out of sight toward the crossing spot, I could hear the geese honking and screaming! Perhaps they met some other geese, I thought. We crossed over the creek and headed back down to the shoreline. There they were, gathered together at the mouth of the creek, waiting for us! 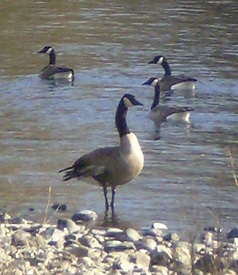 As we continued walking along the bank in the direction of our house, the geese continued to accompany us. They swam purposefully, necks forward, with some mild honking; none of the "side swimming" they often do when floating lazily in the current. Before long they were beside us and began to move ahead. Since there are geese all along the river, I assumed that they were now heading off on their own adventure, to join some other geese. Margarita and I continued until we came to the rocky beach that is our "stopping place," the point at which we climb back up to the road where we live. (The distance from the bridge to our house is about 1/2 mile). We stopped at the beach, and of course, the geese were already there, and passing on by...but lo and behold, once they figured out that we had stopped, they stopped, too (and the ones who had swum on ahead came back). We all just hung out together for a moment, and I thanked them for the wonderful walk. When they realized we were no longer walking, they looked a bit confused, like they weren't sure whether to go back, or keep going; different ones were turning in different directions, as if trying to make up their minds. But eventually they decided to keep going down the river. This was a very special experience that I will never forget. A dog, a woman and 15 geese, out for a joint swim/walk. May the wonders of nature never cease! I had this experience while living in Virginia, some years ago. It was early evening around dusk and I had taken a drive on a little used road through the woods that wound along beside a creek. Parking the car, I was sitting on a huge rock that jutted out into the water. This stream was perhaps 15 or 20 feet wide and rather slow moving in this spot, and all was very quiet and peaceful. I drifted into a very peaceful, almost meditative state, feeling very grateful to be there, enjoying the beauty of the sun slowly sinking behind the distant mountains, and a few horses grazing in the meadow just beyond the creek. A very tiny tinkling sound got my attention, and thinking it was probably a fish, I began looking for the source. A small brown furry head was moving along downstream, but turned slightly in my direction. I watched for perhaps 5 or 10 minutes as the creature would reverse its direction repeatedly to swim back and forth in mid-stream, all the while watching me from a distance. 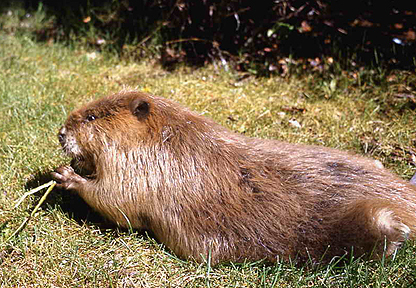 When it would reverse its direction I caught sight of the beaver's wide, flat tail. Having never seen a beaver other than on film, I was delighted and fascinated...and began speaking to him in a very soft low voice. "You're so beautiful .... won't you come a little closer so I can see you better?" IMMEDIATELY he stopped the back and forth stuff and swam straight to me, to within about 6 feet,.and just remained there, never taking his eyes off me. He was so close that I could hear the sound of his munching on a leaf which he held in his front paws. Needless to say, I was, by this time, completely overcome (goose bumps, tears in my eyes etc.) Afraid to move even an inch, I just kept talking to him in the same soft, low voice, and he kept his eyes glued on me, not moving or looking away for an instant. This went on for maybe 10 minutes. Finally, I said, "I understand you beaver people are very busy, so if you have work to do, feel free to go about your business, and I'll just watch." INSTANTLY, he turned and swam to the far bank and began gnawing down a small sapling which he soon draqgged into the water, and, after swimming a little distance, dove with. I was so SHOCKED and AMAZED, it's a wonder I didn't fall off my rock!!! After what was maybe another 10 minutes, I began to wish I hadn't sent him off to work, and wanted to see him again. I said out loud, "Are you still here? Would you please come see me once more?" Well, you guessed it. Of course he immediately reappeared in the same place he had been before (about 6 ft. directly in front of me), at full attention, with his eyes locked on me once more. Again, I talked to him for a while, then said goodbye, thanking him, and staggered back to my car with thoughts of Saint Francis swirling around in my head.